Please make plans now to attend the EdCamp to come to northwest Oklahoma! EdCamp Northwest Oklahoma will be held on Tuesday, June 10, 2014! FREE registration is available via EventBrite! 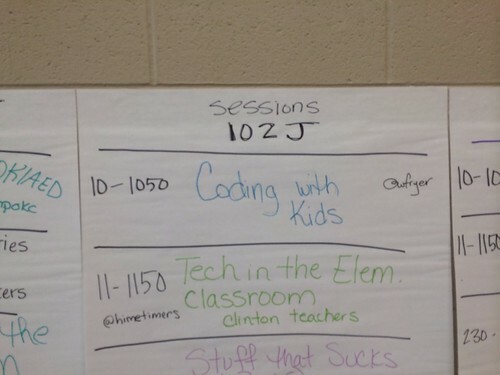 This EdCamp will be held at High Plains Technology Center, 3921 34th Street, Woodward, OK 73801. The organizer team for EdCampNWOK will be meeting the next two weeks to make adjustments to the schedule/agenda and plan for event logistics. If you would like to join the organizer team, please contact Tammy Bruehl or Kristy Ehlers. The website edcampOK.org has been registered to serve as an information hub for both EdCamps and PLAYDATE PD events in Oklahoma. Anyone organizing an EdCamp or PLAYDATE event in Oklahoma can use a free subdomain on this site (like ba.edcampOK.org) to host an event website. Hopefully this will facilitate marketing and communication about and for these events so even more educators in Oklahoma and surrounding states can participate! We hope to see you June 10th in Woodward for EdCamp!